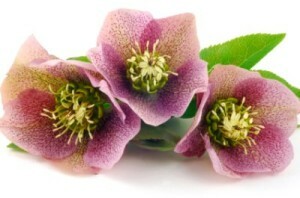 Christmas Rose (Helleborus) is a winter perennial flower that grows outdoors. It is a slow growing flower that once it finally blooms, it lasts for many months. Some can live for up to 3 to 4 months after they are in full bloom. When the flower head starts to bloom, it first blooms in white. Then gradually it turns to a shade of pink. The flower is surrounded by evergreen foliage. The leaves are dark green and glossy. All in all, this makes for a lovely winter plant that you can actually grow outside in your garden. Now, because this plant is a perennial, it will grow back every year. While this plant looks very lovely, it is a poisonous plant. So if you have small children or pets, you may not want this growing in your yard. Unless you have an area away from where your children or your pets play, I do not recommend you planting this rose. So, you’ve decided to plant this winter flower in your garden. The first thing you want to do is to find a spot that gets ample shade. While this plant needs the shade, it also likes some sun during the day. Now, remember, I said that these plants are slow growing perennials. They can take up to 2 years to fully grow into their optimal height. They do spread out and fill out the entire area they are planted in, but it just may take a while. If you live in a climate with mild winters, then the plants will begin to grow in the beginning of the winter months. If you live in a climate with colder conditions, then the plants will sprout towards the end of winter, closer to spring. If you are undecided about planting them from seed, or from plants that are purchased, I would go with purchased plants to start. The growing process takes really long if you start the plants by seeds. Once the plants grow, they spread their seed and produce more flowers.